The Professional Black Man - Where Seeking Success is Serious! Professional black men who value the power of networking, learning, & empowering others. Continuosly seek the knowledge & wisdom for action. Colin Rand Kaepernick (born November 3, 1987) is an American football quarterback for the San Francisco 49ers of the National Football League (NFL). He played college football at Nevada, and was drafted by the 49ers in the second round of the 2011 NFL Draft. At Nevada, he twice was named the Western Athletic Offensive Player of the Year, and he was the Most Valuable Player of the 2008 Humanitarian Bowl. Kaepernick began his pro career as the 49ers' backup to starter Alex Smith. 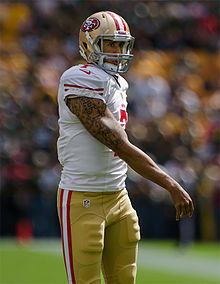 In the middle of the 2012 season, Kaepernick filled in for an injured Smith and became the full-time starter as the 49ers advanced to the NFL playoffs for the second straight season. He set an NFL record for most rushing yards (181) by a quarterback in a game (playoffs or regular season) in his first playoff game. After beating the Atlanta Falcons in the NFC Championship 28–24, he led the 49ers to their first Super Bowl since 1994, where they lost to the Baltimore Ravens. To The Professional Black Man. Where success seeking is serious! This is the long awaited platform for professionals like yourselves to fellowship. The environment here is one that celebrates each of our contributions to our families, society, and most importantly ourselves. make deals, and be inspired to pass your success to others. I look forward to meeting each of you. Entertainment and media entrepreneur Kevin Lilestoday announced his new venture, Go N’Syde – the official beverage of four-time Tony Award nominated Broadway production, The Trip to Bountiful. As a precursor to launching this fall, the new media and beverage company signed on for a unique opportunity to create an exclusive flavor inspired by her character in the play. Liles also serves as a Producer of this classic play by Horton Foote, which features an all-star cast currently on a limited engagement run through September 1, 2013. The drink hopes to transport theater-goers to the hometown roots of Carrie Watts, the character played by Cicely Tyson. Go N’Syde: Carrie’s Bountiful is a Southern-style blend of cinnamon-spiced strawberry lemonade exclusively available to The Trip to Bountifulpatrons during the recently extended 22-week Broadway run. The drink is the first in a series of one-of-a-kind flavors associated with cultural events and icon within the play. As previously announced by the production team, The Trip To Bountiful stars Academy Award nominee and Emmy Award-winning actress Cicely Tyson—celebrating a return to Broadway after 30 years, Academy Award winner Cuba Gooding, Jr., ( Jerry Maguire, Red Tails), Emmy Award nominee and recording star Vanessa Williams (“Ugly Betty,” “Desperate Housewives”), and Tony Award nominee Condola Rashad (Lifetime’s “Steel Magnolias,” Broadway’s Stick Fly). 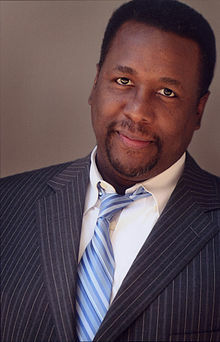 Wendell Edward Pierce (born December 8, 1963) is an American actor. He is best known for his roles in HBOdramas, such as Detective Bunk Moreland in The Wire and trombonist Antoine Batiste in Treme, and as Michael Davenport in Waiting to Exhale. Currently Pierce has a starring role as Teddy on the CBS sitcom The Odd Couple. Not the first to sit during the playing of the National Anthem, but criticized by many who are not facing the root of the problem. There is nothing wrong with standing up or sitting down on what you believe in. Somebody has to do it. Where is your focus America?